A solemn forward by the Chief of the Defence Staff, General Walter Natynczyk affirms that Kathy Stinson’s Highway of Heroes is a fitting tribute to Canada’s fallen heroes and the route they travel from Canadian Forces Base Trenton to Toronto, Ontario. Highway of Heroes is a fictional account of one young boy’s trip as he and his mom accompany his father’s remains from the CFB Trenton tarmac to the coroner’s office in Toronto. The boy is surprised to discover, All the people – on all the bridges – are there because of his dad. A hero. Dramatic photos depict the journey of the convoy and the crowds standing and waiting to honour a fallen soldier. While dealing with a solemn topic, the text encourages young readers to appreciate and echo the respect shown by Canadians who choose to go to the Highway of Heroes and and honour those who have made the ultimate sacrifice for our country. Endnotes include The Story of the Highway, Canadian Soldiers in Afghanistan, Ways to Honour Those Who Are Killed or Wounded In Service to Their Country. Remembrance Day is observed annually in Canada, on November 11th. In the days leading up to November 11th, it is particularly important for adults to find ways to make Remembrance Day meaningful to young children so that they can join with all Canadians in honouring our Veterans, especially those who made the ultimate sacrifice. A Poppy Is to Remember is a wonderful picture book resource for Canadian families, classrooms and libraries. A Poppy Is to Remember explains, Once there was a long and terrible war – a war some called the Great War. Many young men went off to fight, and many did not return home to their families. As the battle raged, poppies grew in the battlefield and were seen by a Canadian army doctor, John McCrae. McCrae was inspired to write In Flanders Fields, a poem often read at Remembrance Day ceremonies. Beautifully illustrated, A Poppy Is to Remember salutes John McCrae and shows readers how poppies are used today when remembering the contributions of present day members of the armed forces as well as veterans, those who care for them and those who mourn their loss. 32 pages, suitable for children aged four and up. Additional materials for older children or adults include The Story of the Poppy and Remembrance Day in Canada. 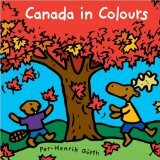 This vibrantly illustrated concept book depicts the colours of Canada from coast to coast. Mr. Gurth begins with a happy, snowy white scene and then takes readers into a lush, green forest. Vivid, graphic illustrations highlight the red sands of Prince Edward Island, the deep blue St. Lawrence River, parklands and dancing fields of sunny, yellow wheat. After sunset, he shows us a twinkling Big Dipper and shimmering northern lights. A bold celebration of colors and Canada, Canada in Colours is suitable for toddlers and preschool-aged children. Canada Day is celebrated July 1st. Today we are highlighting our free early learning printables including our writing paper for Canada Day. Storytime Standouts offers writing paper for (almost) every occasion, check out the entire collection by visiting our Interlined Paper page. Here’s a fun way to celebrate Canada Day – check out our Canadian Picture Book crossword puzzle.